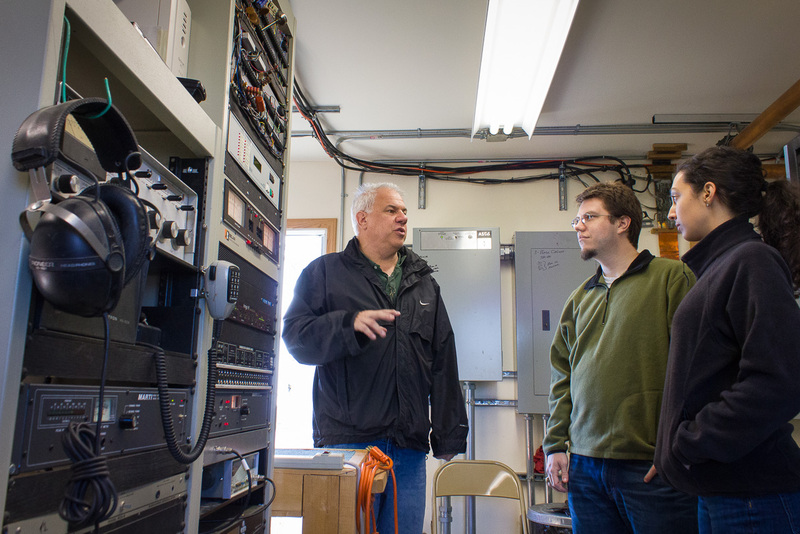 September 2012: general manager Ric Schmidt takes then-new volunteers Lucus Keppel and Margaret DeMaioribus on a tour of KNOM’s AM transmitter. What do volunteer fellows do? What if I have no broadcasting experience? I can’t imagine living in such a remote place. How do you handle the darkness? What is community life like? Do volunteer fellows get vacation time? Do you pay my way? What about toiletries and personal items? Can my student loans be deferred? Does KNOM provide any educational incentives? Does KNOM provide health insurance? Why are you on the air? Each volunteer fellow at KNOM Radio assumes a wide range of responsibilities: from news gathering/writing/reporting to audio production and on-air hosting. By the end of 54 weeks of service, a volunteer fellow will have traveled to multiple rural Alaska communities outside of Nome (typically on their own or with minimal supervision); developed professional relationships with contacts and leaders in the region; read daily weather forecasts; produced both long- and short-form and breaking news stories; deejayed hundreds of hours on the air; and continued KNOM’s legacy connecting with the communities of Nome and Western Alaska at large. Their work will have been heard on KNOM’s AM and FM radio signals and read and heard on this website, knom.org. The KNOM volunteer fellowship thus provides participants with a broad introduction to many areas of broadcast radio and online media. All fellows also pitch in with the rest of the staff, covering race season and other local events, cleaning the building, making coffee, and “other duties as assigned.” Together, we strive to make our work environment pleasant and to produce the best quality product for our listeners and those who interact with KNOM online. We train on the job; no prior broadcast experience is necessary! It is important that you can write clearly and concisely and that you can speak in clear, un-accented English. 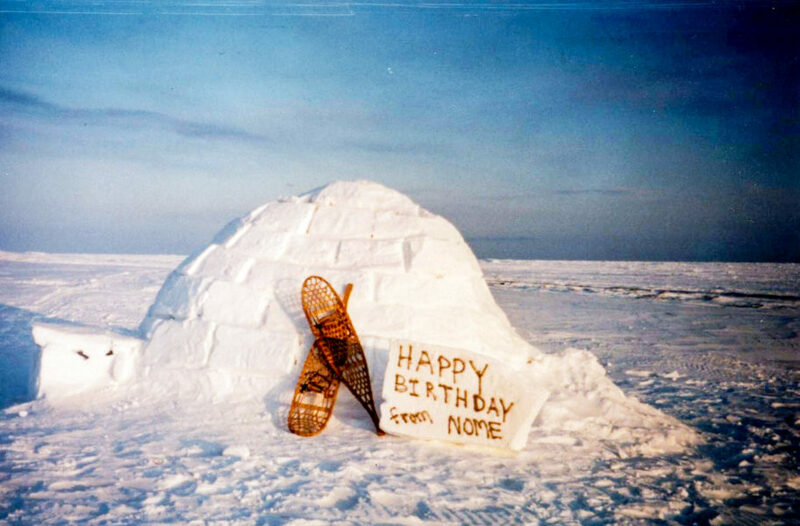 It’s true that Nome is isolated geographically, but there are many ways to stay active and to keep in touch with loved ones. There’s plenty to do in town. Many volunteers take college courses at the local branch of the University of Alaska-Fairbanks; a few have even taught there! Throughout the year, opportunities to play sports and stay healthy are plentiful; the Nome Recreation Center (a few blocks away from the volunteer house) offers basketball, soccer, a rock-climbing wall, and a weight room equipped with treadmills, bikes, elliptical machines, free weights, and strength training equipment. Nome offers a swimming pool, an excellent public library and a full-sized movie theater (with stadium seating!). Nome’s many churches, clubs, and organizations provide the opportunity to give back to the community; volunteer fellows often take leadership roles. In the summer, Nome folks often hike in the mountains, pick wild berries on the tundra, catch fish in the rivers, or relax on the miles of quiet beach. In the winter, many volunteers go ice skating, cross-country skiing, snowboarding, or snow-shoeing; some even fish for crab on the frozen Bering Sea. The volunteer residence offers wireless internet access, long distance telephone service, and the option for cable television. Most cellphones from the lower 48 still work in Nome. The winters can be harsh, but there can be delightful winter weather, also, and the town is usually snow-free from mid-May to early October. Because Nome is on the seacoast, winter temperatures are milder than in Alaska’s interior. Winter days can vary from +20° to -25° F, with occasional colder periods dropping below -40° F every couple of years. Adaptation to the cold is surprisingly easy. Both the KNOM studio and the volunteer house are super-insulated buildings, well heated and cheerful. Since Nome is south of the Arctic Circle, we have sunlight every day of the year: 3 hours 54 minutes of it at the winter solstice. Conversely, between May and August, the sky never gets completely dark. Interestingly, newcomers find it more difficult to adjust to the brightness of the summer nights. The swing in light provides interesting reading for relatives back home, but it’s prosaic for long-term residents. The KNOM volunteer house is a 7-bedroom, super-insulated home with full amenities, including cable TV, wireless internet access, long-distance telephone service, and a second floor deck with a great view of downtown Nome and the Bering Sea. With a full house, there is always something going on. The volunteer community assembles for meals and games, but you will have your own room for privacy, as well. Volunteers share grocery shopping, cooking, and cleaning duties. All full-time volunteer fellows have the option to use up to five days of personal leave during their service year (per approval with their supervisor). Also, after their first year of service, volunteers who decide to re-enlist for a second year receive 20 working days of vacation, with round-trip air transportation home and $100 expenses paid by KNOM. Travel or leave during some periods, such as December or March, may not be possible. The only way in or out of Nome is by jet airplane from Anchorage. Nome is served by one major carrier, Alaska Airlines, and by smaller airlines that fly to more remote communities. Flight time from Anchorage is about 1-1/2 hours. If you’re accepted, round-trip airfare is provided. At the end of their year, some volunteers prefer to wend their way home via scenic routes, such as by ferry down the Southeast Alaska coast. For these options, KNOM provides $500 cash in lieu of return fare. Sheets and towels are provided in the volunteer residence. Nome has two grocery stores where you can buy just about anything you need. Keep in mind, however, that the selection/variety of some name brands is quite limited and that prices for almost all items are about double what you’d expect in the Lower 48. It’s a good idea to stock up on personal items before you come up, especially if you’re partial to certain name brands that may not be available in Nome. Online shopping also helps many Nome residents supplement what they’re able to purchase in town. Everyone in Nome dresses casually; the town has no dry cleaning facilities, and formal wear (jackets and ties, gowns and evening dresses, etc.) is very rarely needed, if ever. Work attire at KNOM is casual. Even in winter, volunteers typically wear slacks and blue jeans, t-shirts, sweaters and sweat shirts. The volunteer house has extra winter gear. If you’re accepted to volunteer, we can recommend specific types of clothing you’ll want to bring. It’s up to you to provide us the proper forms by which payment on loans can be deferred. Currently, volunteers have had no problem being granted Economic Hardship Deferments. Volunteers who complete a year of service are eligible for the KNOM Fellowship Award to cover past or future education expenses (such as remaining balances on student loans or expenses related to graduate school). If volunteers renew for a second year and complete that term of service, they are eligible for an additional fellowship award. Yes, medical insurance is provided, along with limited dental and vision insurance. Volunteers are expected to have a full dental checkup before arriving in Nome. KNOM provides room and board and a monthly personal stipend to each volunteer. Of course, volunteers also gain invaluable experience in broadcasting. You bet. KNOM has been honored with many awards in its nearly 40-year history. Most prominently, the station has won 19 Gabriel Awards for Radio Station of the Year from the Catholic Academy for Communication Arts Professionals; we won this top Gabriel award 16 years in a row – from 1996 through 2011. The station has received four Crystal Awards and three Marconi Awards from the National Association of Broadcasters, plus top honors from the Alaska Broadcasters Association. KNOM’s programming has earned Silver Microphone honors and Crystal Communicator Awards, among others. Applications are accepted on a rolling basis until all positions are filled, with priority given to those received by February 15. The application review and interview process continues in the spring, and positions start in June and July each year. If you’re interested in applying later in the year, send an email to General Manager Margaret DeMaioribus at belong@knom.org. Inquiries are always welcome. A staff of just a few dozen people – a mix of permanent employees, full-time volunteers, and community deejays – keeps KNOM Radio running and on-the-air. Their tireless work, and the generous support of our many wonderful donors, makes our mission possible. KNOM’s programming is broad, carefully crafted to appeal to the diverse listening audience in Western Alaska (especially in the villages of our region). Our programming is a mix of entertainment, information, and inspiration. Our music shows feature everything from current pop and alternative to oldies, country, classic rock, jazz, classical music, ambient music and electronica, indie rock, Americana and bluegrass, dance music, and much more. We’re honored to showcase the traditional music of Alaska’s oldest cultures, with one Alaska Native song played during most hours on weekdays. An essential part of our programming is our news, weather, and community information. We report on what’s happening and what’s relevant to Western Alaska, with daily newscasts, hourly weather reports, and bulletin-board-style announcements for the communities in our region. Our daily hotline program (featuring point-to-point messages) is perhaps our most popular; it allows residents in Western Alaska to keep in touch, even if they don’t have access to a telephone, a computer, or, for that matter, electricity. 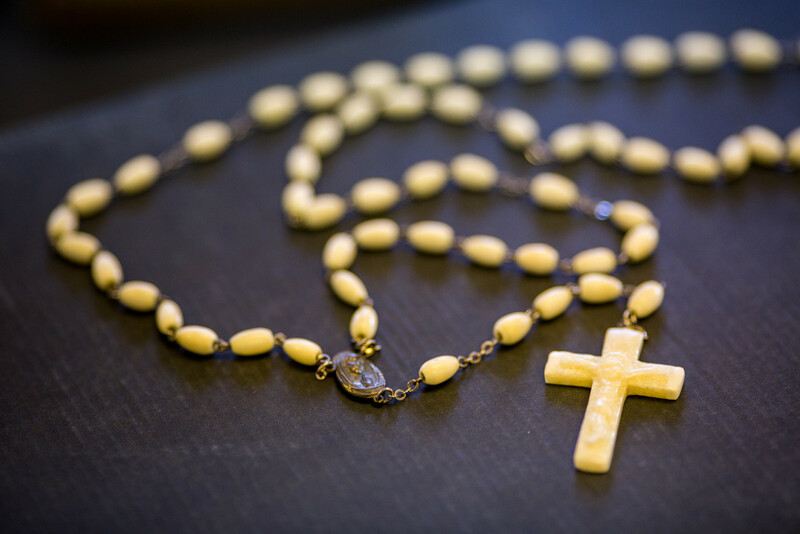 KNOM is a Catholic station (the oldest in the United States), and we’re proud to broadcast nightly readings of the Rosary and weekly airings of the Mass, as we’ve been doing for decades. Our inspirational spots are also one of our oldest traditions; listeners in Western Alaska can hear these brief, 30-to-90-second messages on uplifting topics during most of our broadcast hours. The average hour on KNOM features approximately 45 minutes of popular music, a blend of many styles, interspersed with short spots, both inspirational and educational, sprinkled among the music and chat like commercials. Altogether, about 40% of KNOM’s programming is news, weather, and other information. KNOM exists to provide companionship to the residents of Western Alaska’s far-flung villages, some of which battle health and sanitation problems, poverty, alcohol abuse, and domestic violence. We serve information, education, and inspiration, in an effort to uplift and connect communities in the midst of these hardships. In a quiet but effective way, the station also brings Catholic inspiration and programming into many far-flung places that do not have full-time priests. There are many ways to get in touch with KNOM! To see what’s going on at KNOM, find us on Facebook, Twitter, and Instagram. You’ll also find information about the KNOM volunteer program on Idealist.org and on the website of the Catholic Volunteer Network.